On the ‘must have’ list for the wine lover! This incredible Wine Bar can ensure your favorite red and white wines are being enjoyed at their optimum serving temperatures, at the same time. The Wine Bar is equipped with the Perfect-Temp System; 4 pre-programmed controls of the recommended serving temperatures for red, rose, white wine and champagne. 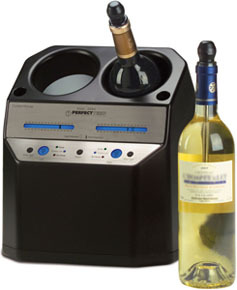 Just press the button until the icon that matches the type of wine chilling appears and the unit will adjust the cooling so your wine is served at its best. Features the Wireless Temperature Sensors. These innovative thermometer sensors measure the actual liquid temperature not the chamber temperature. The easy to read LCD displays both the current liquid temperature and the target temperature for the wine selected, maximizing your enjoyment. 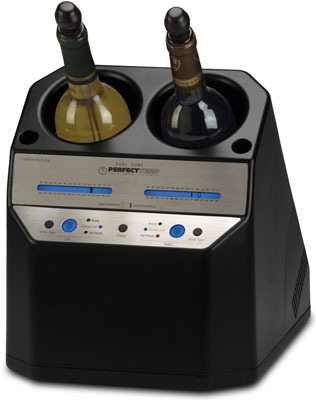 Make sure your wine is at the perfect temperature!